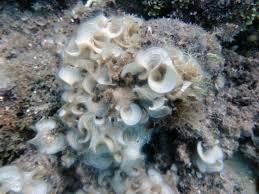 Study of Padina australis, UV-VIS, HPLC and Antibacterial. This study aimed to explore Padina australis using UV-VIS, HPLC and Antibacterial. Brown algae (Padina australis) obtained from Padike, Talango, Madura. Sampling was done using GPS. Extraction method was done using CaCO3 as neutralizing plus premises of methanol and acetone (7/3 v / v in 300 ml). Analysis was done using UV-VIS and Shimadzu spectrophotometer with a wavelength of 300-800 nm. The disc test showed that the concentration of Padina australis extract inhibits the growth of salmonella at a concentration of 10.000 ppm or equal to 4.6 pm ethanol, and at a concentration of 10,000 ppm is equal to 6.23 nm salmonella typhi with methanol. Reversed-phase HPLC method with the brand Shimadzu LC-20A (ODS.C-18) used for identification of chlorophyll a fucozanthin 412.5 nm and 439 nm. The identification of brown alga Padina australis obtained wavelength value chlorophyll b 444.583 nm, fucoxanthin 450,455 nm, chlorophyll a 618,664 nm, feofitin 665 nm and β caroten 426,451 nm, while the results of the identification of crude brown alga Padina australis has a retention time chlorophyll c 6.432 sec, fucoxanthin 10.22 sec, chlorophyll a 38.5 sec, feofitin 56.82 sec and β caroten 62.144 sec. Keywords: Antibakterial, HPLC, Padina australis, UV-VIS. Phytochemicals and Antibacterial Activities of Soursop Leaf (Annona muricata) against Edwadsiella tarda (In Vitro). Anggana Rarassari M and Nursyam Maftuch H.
Edwardsiella tarda is bacteria in fish caused of Edwardsiellosis disease and it was include to plague bacteria that can harm. Edwardsiella tarda infection controlled by using a natural antibacterial that is Annona muricata. The aim of this research is to know the content of secondary metabolites in leaves of the soursop (Annona muricata) as well as an effective solvent to extract Annona muricata to be an antibacterial against on Edwardsiella tarda by disc diffusion method. Experimental method used in this research is descriptive and it is based on 2 types of leaves (fresh and dried), 3 different treatment solvent (ethanol, ethyl acetate and chloroform) and three replications. Data obtained from the study was statistically analyzed used statistical applications, SPSS version 21.0. The results of the crude extract of dried Annona muricata is in accordance with the results of phytochemical contained phenols, saponins, tannins and flavonoids as well as the best use of ethyl acetate solvent to the extent of inhibition with 15:41 mm. 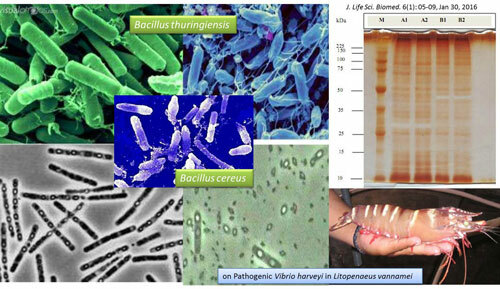 Antimicrobial Activity of Bacillus cereus and Bacillus thuringiensis on Pathogenic Vibrio harveyi in Litopenaeus vannamei. Masitoh M. M., Hariati A. M. and Fadjar M.
The bacterial strain of Bacillus cereus and Bacillus thuringiensis have been known to produce antimicrobial activity against pathogenic Vibrio harveyi. 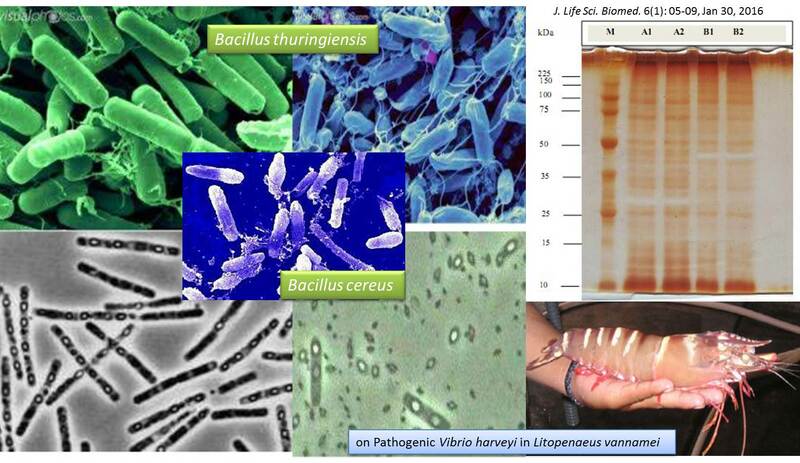 The effect of B. cereus and B. thuringiensis were tested by in vitro and in vivo. In vitro test was used to analyze antagonism characteristic of bacteria using the paper disc diffusion method. In vivo test was applied to evaluate antimicrobial activity of B. cereus and B. thuringiensis (105 CFU ml-1) on survival rate and histopathology of Litopenaeus vannamei challenged with V. harveyi. The results showed that B. thuringiensis had a greater inhibitory activity of 18.60–35.97 mm. Both Bacillus bacteria treatment resulted in survival rate of 100%, compared with 75% in the treatment without Bacillus. We can concluded that B. cereus and B. thuringiensis have potential applications for controlling pathogenic V. harveyi in shrimp aquaculture. Keywords: Bacillus cereus, Bacillus thuringiensis, inhibitory activity, V. harveyi. Characterization of Bacteriocin Lactobacillus casei on Histamine-Forming Bacteria. Nugrahani A, Hardoko, Martinah Hariati A.
Tuna which has undergone a process of decay will be poisoned if being consumed. It caused by the contamination of pathogenic bacteria such as Escherichia coli, Salmonella, Vibrio cholerae, Enterobacteriacea etc. Some types of fish contain histidine family scmbroidae high free, such as yellow tail tuna 740 mg/100g of meat, bigeye tuna 491 mg/100 g, mahi-mahi 344 mg/100 g, mackarel 600 mg/100 g, skipjack 1192 mg/100 g and albakor highest to 2 g/100 g. The formation process of histamine in fish is influenced by the activity of the enzyme L-Histidine Decarboxylase (HDC). Bacteriocin Lactobacillus casei extract is able to inhibit the activity of Pseudomonas sp, Proteus morgani and Micrococcus sp. The extract of bacteriocin Lactobacillus casei has a high temperature stability which has inhibitory activity against bacteria test at a temperature of 90oC. Bacteriocin Lactobacillus casei from bacteria Pseudomonas sp has the optimum activity at pH 5 with inhibition diameter of 8.25 mm, while the bacteria Micrococcus sp has the optimum activity at pH 4 with a inhibition diameter of 9.25 mm. Bacteriocin Lactobacillus casei has a molecular weight of 14.34 kDa which included in the group of class III bacteriocins, generally has a large size (> 10 kDa), and can not survive against the heat. Bacteriocins Lactobacillus casei extract can inhibit the activity of histamine-forming bacteria growth and have stable properties to high temperature and pH. Future research is recommended to do the production of bacteriocins Lactobacillus casei optimization and its application in fishery product.